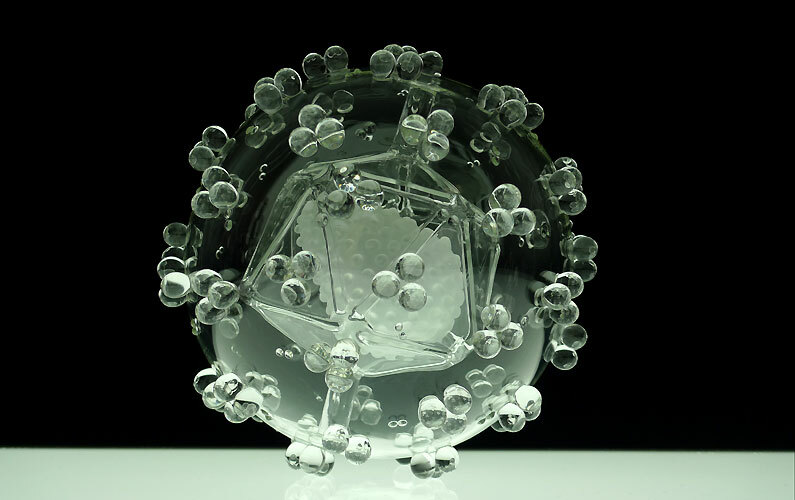 If you’ve ever wondered what viruses and bacteria such as HIV or SARS looks like, a new exhibition at the National Centre for Craft & Design will reveal all. The exhibition by Luke Jerram will open on Friday, February 1 and will showcase exquisite glass works relating to this very subject. Mr Jerram’s ‘Glass Microbiology‘ is the exploration of clear glass rendering of viruses and bacteria such as HIV, H1N1 and SARS. Made to contemplate the global impact of each disease, the artworks were created as alternative representations to the artificially coloured imagery we receive through the media. By extracting the colour from the imagery and creating jewel like beautiful sculptures in glass, a complex tension has arisen between the artworks’ beauty and what they represent. Working alongside this section of the exhibition will be Lincoln University with their ‘pop up’ science lab giving visitors the opportunity to look down high resolution microscopes in order to see bacteria up close and in all its varied form. Jerram’s Glass Microbiology sculptures are in museum collections around the world from The Corning Museum in New York to the Wellcome Collection in London. In 2007 he was awarded the Institute for Medical Imaging Award’ and in 2010 the coveted “Rakow Glass Award” for his work. Jerram has recently completed a fellowship at the Museum of Glass, Washington, USA and in 2009 his sculptures were presented at The Mori Museum, Tokyo alongside work by Damien Hirst, Warhol and Leonardo da Vinci. This entry was posted in Uncategorized and tagged Corning Museum of Glass, Damien Hirst, Glass, Luke Jerram, Museum of Glass, New York, Washington, Wellcome Collection. Bookmark the permalink.